Located In a National Register of Historic Places neighborhood, the spectacular Queen Anne-style King-Keith House is one of the most photographed houses in Atlanta. 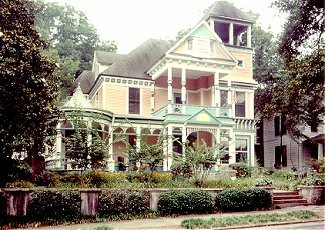 The 1890 Victorian Painted Lady was built by the local hardware magnate, George King. Old house enthusiasts will enjoy the varied architecture of the restored neighborhood shaded by live oaks and including such homes as the residence of the founder of Coca-Cola. Within walking distance of the funky Little Five Points commercial district, the Bed and Breakfast is close to Atlanta's most popular intown shopping, restaurant and theatre areas. Two miles from downtown and two blocks to MARTA (subway) station, transportation to the airport and downtown sporting, cultural and convention events is easily accessible. Your hosts are always available for pick-up at the MARTA station and for rides to the nearby events and excursions. The King-Keith House boasts twelve foot ceilings and carved fireplaces. The elegant public spaces include a baby grand piano for guests to enjoy. Spacious guest rooms are furnished with authentic period antiques and elegant accessories. The architect-owner and his wife have renovated/restored four homes - with this hopefully being their last! Your hosts enjoy antiquing, decorating, gardening, cooking and entertaining. Whether your visit to Atlanta is for a Braves game, an evening at the symphony or convention, your stay will be enriched by your visit to the King-Keith House - where Southern Hospitality is alive and well. Romantic Country Inns, Getaways and B&Bs offer a great Atlanta lodging alternative to big hotels.